Having a quick scan through their first ten entries in the Mega Duck's line-up it's pretty clear what Sachen's mandate had been: Fill it with as many clones of existing puzzle franchises as possible. While the system did eventually get some more original fare it was rather overloaded with clones at this point and Vex, or Klax as most gamers might better remember it, is no exception. Ported to just about every system on Earth back in the day Klax was a typical match the falling block puzzler that stood out graphically because of it's use of vibrant colour and pseudo-3d perspective with blocks tumbling down a narrow strip towards the player in a manner that must surely have influenced the design of Guitar Hero years later. These could be collected at the bottom by a little holding tank and stacked up to strategically place them in rows of 3, whereupon they would disappear and be converted into points. Vex, then, is a straight-up clone of Klax, minus the into-the-screen perspective and minus any colour that isn't one of the Mega Duck's various shades of green! Not a great start. The game will issue a different challenge on each stage that must be completed to move on. These will alter depending on the difficulty level selected. The simpler flat 2d display does make planning easier on a monochrome screen than the flipping tiles of the Gameboy conversion of Klax. 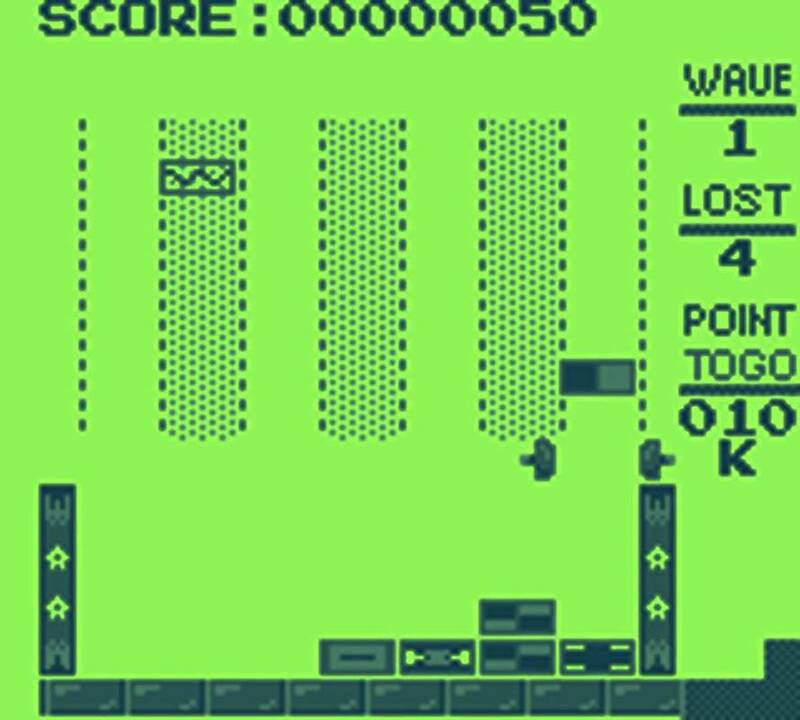 While the decision to switch up the perspective is odd, given that Klax was successfully ported to the original Game Boy, it is actually easier to see what is going on on a flat 2d plane while playing on a monochrome screen and this leads to less frustration in Vex. Each stage begins with a challenge, based on either obtaining a certain score or getting a certain number of lines in either a horizontal, vertical or diagonal pattern. The latter is particularly tricky and involves some neat use of the stack feature and forward planning, creating some tense moments of gameplay punctuated by sharp relief or a desire to try again. 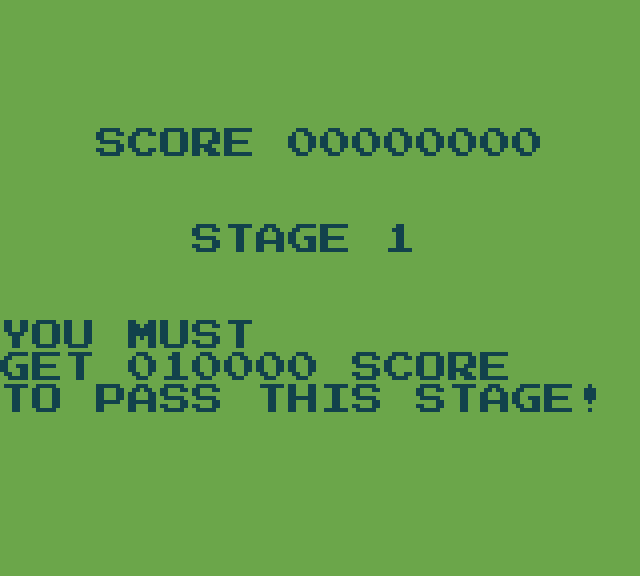 Unfortunately the 'get XXXXXXXX score' stages can be tedious as the game's convoluted multiplier system rarely takes effect and is difficult to plan for, making these somewhat of a slog but also hard to track if you don't pay careful attention to your score at the start of the round and mentally do the maths to see what is required as an add-on. Ultimately, Vex is another nice early puzzle outing for the Mega Duck that is fun in short bursts but could have done with more polish to keep people coming back for more. As with Bomb Disposer, it could have done with a few extra gameplay modes to keep things fresh. A reasonable effort at cloning a classic but lacking the charm of the original.